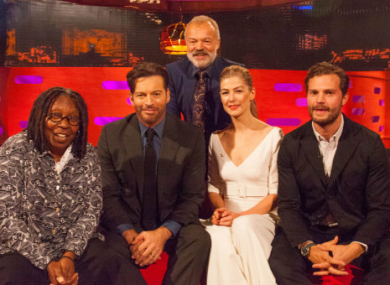 Tonight, Graham is joined by Jamie Dornan, Whoopi Goldberg, Rosamund Pike, Harry Connick Jnr, and music from Korean boyband sensation, BTS. Ryan is over in London for a once off special show. The guest line up is massive, and includes Graham Norton, Brendan O’Carroll, Nigel Farage, Alastair Campbell, Laura Whitmore, Angela Scanlon, Mick McCarthy, Eamonn Holmes, Imelda May and Barry McGuigan. Phew. Jennifer Lopez stars in this film about a woman whose marriage turns sour when her husband becomes violent. She goes on the run with her daughter, while her husband goes after her. She’s left with no choice but to fight back. Yes, it’s the story that just won’t end now. The Strictly judges will appear on The Jonathan Ross Show on Saturday, and we can expect them to voice their opinions on the Seann and Katya kiss that has dominated headlines for the past week. Craig Revel said he’s glad they’re staying on the show. My take was keep them in the show, make them do the Dance of Shame, if you like. It’s really important that, if this does happen to you, you face up to it. You either, as they’ve done, apologise, which is absolutely fine. But get on with the job and show people what you’re made of and show people ‘OK, this is what I did, I’ve been employed to do this job, I’m going to go on, do the job, get on with it and do it well and do it professionally’. Craig then went on to compare it to kissing your boss at the Christmas party and showing up the day after. Lethal Weapon 2 (RTE 2, 9.45pm) The sequel to the original blockbuster about two LA cops. The GBBO, An Extra Slice (Channel 4, 8pm) Get some extra bake off content into ye. Gogglebox (Channel 4, 9pm) The British version, but still good. The Royal Wedding (Virgin Media Two, 8.30pm) Highlights from the day Princess Eugenie of York married Jack Brooksbank.